Researchers at Case Western Reserve University have combined tissues from a sea slug with flexible 3-D printed components to build "biohybrid" robots that crawl like sea turtles on the beach. A muscle from the slug's mouth provides the movement, which is currently controlled by an external electrical field. However, future iterations of the device will include ganglia, bundles of neurons and nerves that normally conduct signals to the muscle as the slug feeds, as an organic controller. The researchers also manipulated collagen from the slug's skin to build an organic scaffold to be tested in new versions of the robot. "We're building a living machine—a biohybrid robot that's not completely organic—yet," said Victoria Webster, a PhD student who is leading the research. Webster will discuss mining the sea slug for materials and constructing the hybrid, which is a little under 2 inches long, at the Living Machines conference in Edinburgh, Scotland, this week. The researchers chose the sea slug because the animal is durable down to its cells, withstanding substantial changes in temperature, salinity and more as Pacific Ocean tides shift its environment between deep water and shallow pools. Compared to mammal and bird muscles, which require strictly controlled environments to operate, the slug's are much more adaptable. For the searching tasks, "we want the robots to be compliant, to interact with the environment," Webster said. "One of the problems with traditional robotics, especially on the small scale, is that actuators—the units that provide movement—tend to be rigid." Muscle cells are compliant and also carry their own fuel source—nutrients in the medium around them. Because they're soft, they're safer for operations than nuts-and-bolts actuators and have a much higher power-to-weight ratio, Webster said. The researchers originally tried using muscle cells but changed to using the entire I2 muscle from the mouth area, or buccal mass. "The muscle already had the optimal structure and form to provide the function and strength needed," Chiel said. Akkus said, "When we integrate the muscle with its natural biological structure, it's hundreds to 1,000 times better." 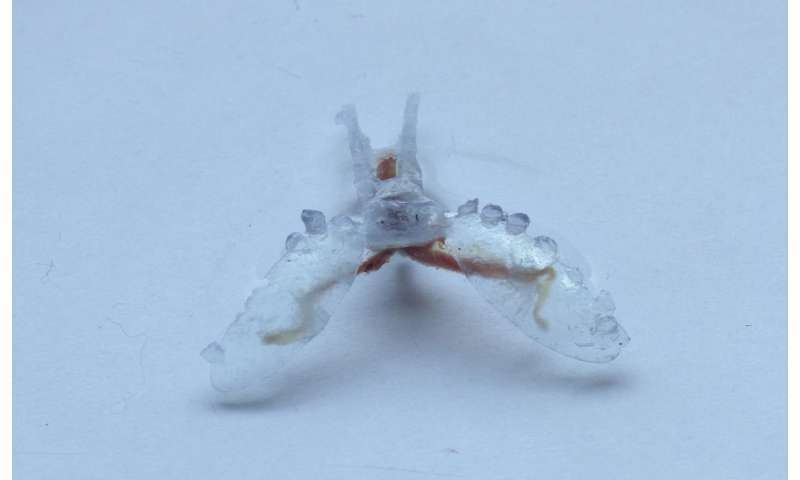 In their first robots, the buccal muscle, which naturally has two "arms," is connected to the robots printed polymer arms and body. The robot moves when the buccal muscle contracts and releases, swinging the arms back and forth. In early testing, the bot pulled itself about 0.4 centimeters per minute. With the goal of making a completely organic robot, Akkus' lab gelled collagen from the slug's skin and also used electrical currents to align and compact collagen threads together, to build a lightweight, flexible, yet strong scaffold. If completely organic robots prove workable, the researchers say, a swarm released at sea or in a pond or a remote piece of land, won't be much of a worry if they can't be recovered. They're likely to be inexpensive and won't pollute the location with metals and battery chemicals but be eaten or degrade into compost.